Significant controversy surrounds the appropriate treatment of irreparable rotator cuff tears. A host of varying treatment options is available for the treating shoulder surgeon. However, diligent patient evaluation should allow for a tailored treatment plan based upon specific patient symptoms and physical exam findings. This chapter reviews available diagnostic criteria to assist in the identification of the irreparable rotator cuff tears. 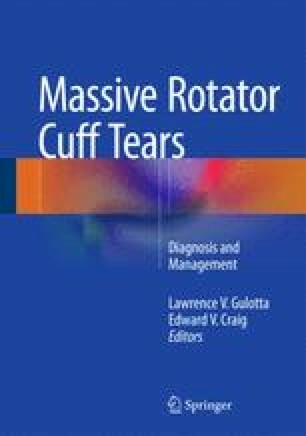 This chapter will also offer a review of the diverse treatment options for irreparable tears of the rotator cuff. These options include physical therapy, arthroscopic treatment, tendon transfers, and arthroplasty. In conclusion the authors offer a reproducible and reliable treatment algorithm to help guide surgeons in treating this difficult clinical scenario.